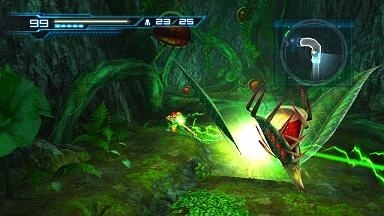 Nintendo's Metroid: Other M is due out in a couple of months but it was still a hot demo at this year's E3. After checking out things on the 3DS and getting a little hands on time with Zelda, I went straight to check in with Samus and her new game. Metroid: Other M offers an interesting mix of gameplay styles and the fluid transitions between them are a big part of why it works. To begin, the game delivers the same side-scrolling platform action the series has been known for. You play with the Wiimote held in classic gamepad fashion as you jump, shoot and roll your way through waves upon waves of enemies. The formula is as solid as ever and, though it doesn't do anything particularly new, it does what it does very well. I particularly like the auto-targeting system; it lets you focus on the action without bogging you down in details. The auto aim is a huge help when the game transitions from side-scrolling to more open third-person platform action. Again, the transitions are seamless. You'll be racing along a hall, blasting enemies and jumping over pits when suddenly the environment behind Samus suddenly opens up and you find yourself exploring and fighting in a large open room. The shift in focus really works to keep the game fresh, and keeps you from feeling restricted by the side-scrolling bits. But that's not the only surprising viewpoint in Metroid: Other M. Players can point the Wiimote at the screen to enter first-person view, which allows them to investigate clues, activate switches and fire weapons with pinpoint accuracy. In some cases, you'll just be checking a distress call, or firing a charged bolt to open a locked door, but in other cases you'll be using this first person view to take on challenging bosses. You can't move the position of your character in this mode, but you can look around a full 360 degrees. I've always kind of thought of Samus as faceless, so it was strange to see the demo start out with some strong, character-driven cutscenes. These appear to be a new direction for the game and, while they're not bad by any means, it does feel a little different from what I think of when I think of Metroid. Without giving away any details of the story, it picks up right after Super Metroid. Samus has received a distress call from a nearby ship and, when she goes to investigate, she encounters a group of marines trying to get through a locked door. Adam Malkovich is among the marines and it's clear from his attitude to Samus that the two have some tension together in their past. It's not made clear just what that tension is about, but Adam wants nothing to do with Samus. That is, until she manages to help the marines open the door. There are a few more story elements to spill here, but they really should be experienced as you play, so I won't spoil them here. Suffice it to say that, assuming you don't mind the shifts in perspective both for the narrative and gameplay, Metroid: Other M looks like another great addition to the franchise.